I don’t feature The Old Forge very often but not because it isn’t worthy: it’s simply that The Priory is the main star of my blog and a jealous one too. 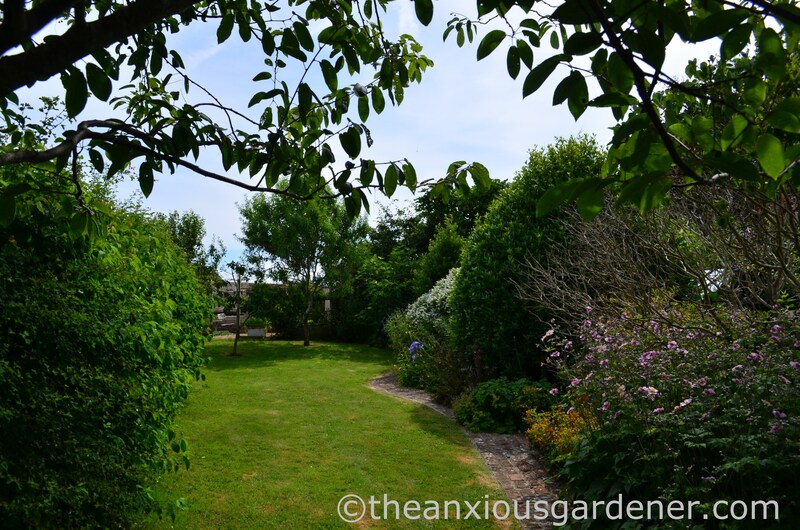 Nevertheless, in late July on my regular Tuesday visit, I took some snaps and thought I’d give you a short – if incomplete – tour of the second garden I tend. 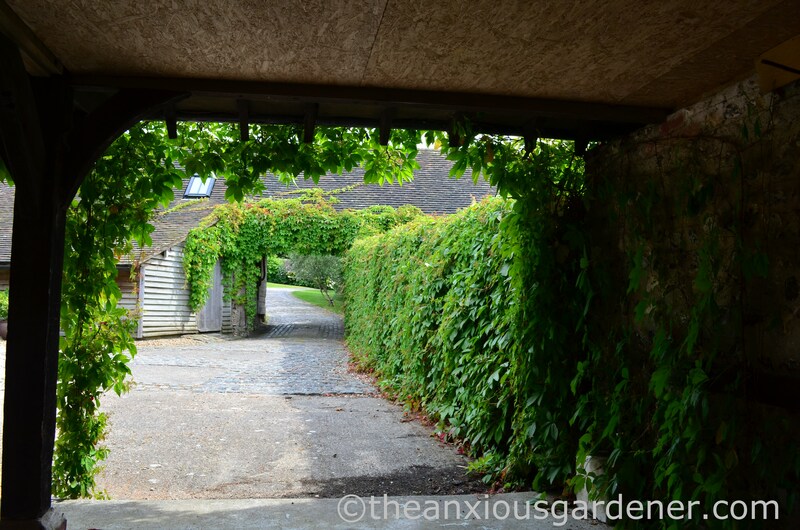 Having entered through the white farm-gate, walked down the drive and past the wisteria covered house (none of which I photographed on this occasion – oops), we pass through an archway beneath outbuildings to arrive at the car-port and parking area. An exciting start. 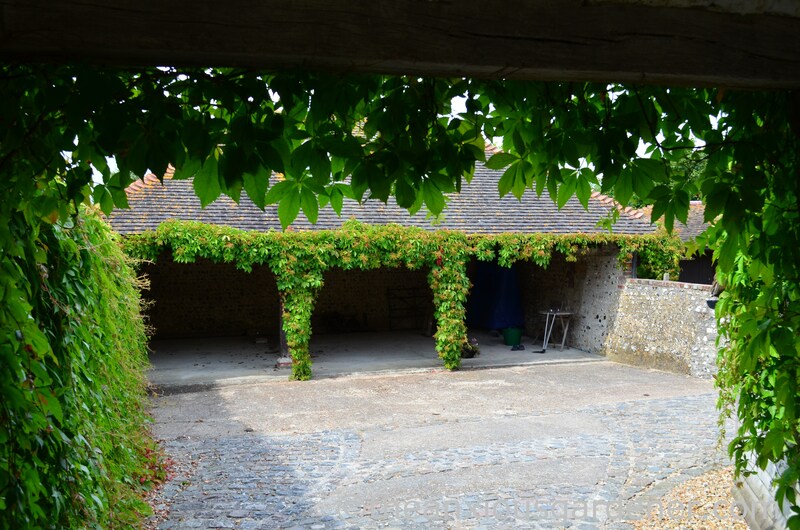 During the six years I’ve worked here, I’ve allowed a massive Virginia creeper (Parthenocissus quinquefolia) to cover walls and buildings; and trained two long tresses to hide the pillars supporting the car-port roof. (It seemed important to do that – I don’t know why). From inside the car-port you can see just how extensive this plant is and how enormous its reach. 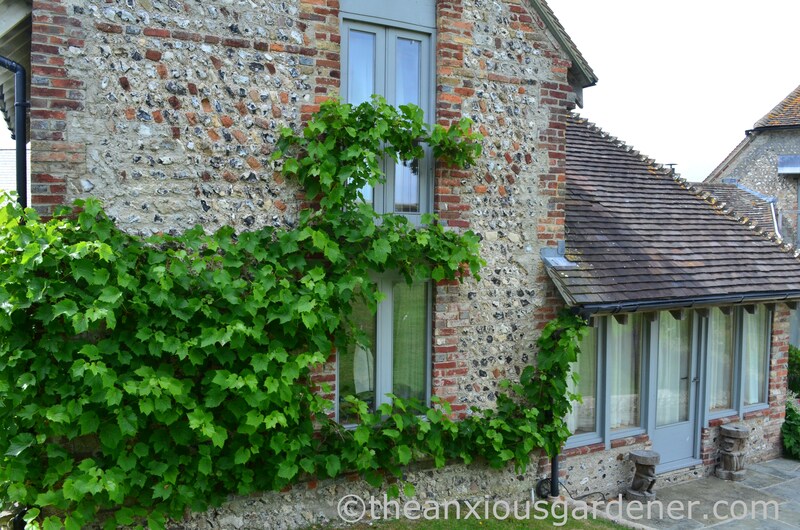 I shall clear growth off the roof before stems wriggle under gaps, swell fat and dislodge tiles. 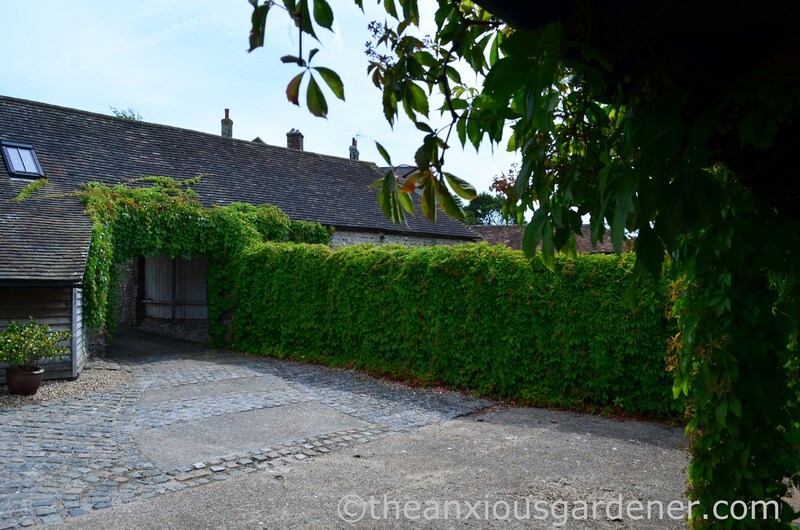 It is a rampant creeper and I regularly cut away unwanted tendrils or the mat of growth that spreads out across the hardstanding (except when I don’t – as in the following photo). I like how the Virginian softens an otherwise sterile car-park and for a short while turns a marvellous, shocking red. Behind the car-port broods the oil tank on gravel. 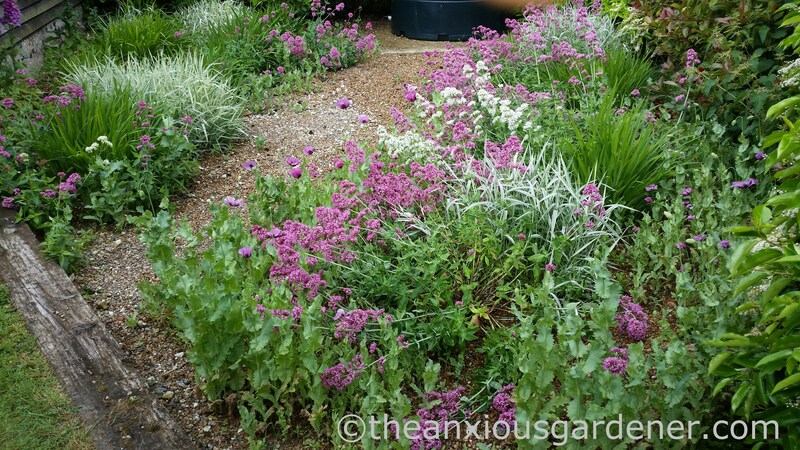 I wrote about this gravel garden last year. and I’d completely forgotten shaking foxglove seed-heads along the base of that wall a couple of summers ago. In July, with most of the valerian finished and the opium poppies over, crocosmia starts turning the hitherto white and pink scheme orange. 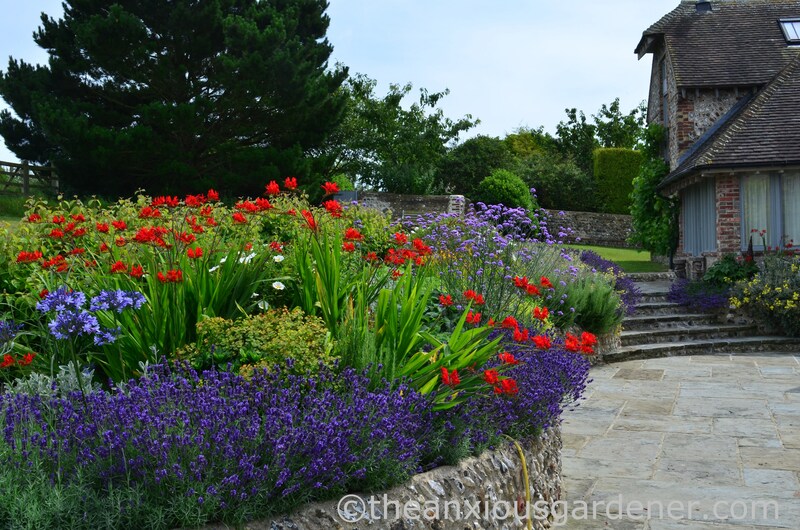 Back to the car-park now and across the main lawn towards the back of the house where a large, new border fronts a paved seating space outside the kitchen door. I grimly fight rabbits all year-long and this border has been our bloodiest, most contested battlefield. New plants are dug up, fresh growth snipped or chomped at leisure, holes dug often and deep. I commonly see twenty rabbits on arrival and despite my frothing rage they barely bother running for cover. Who won this protracted struggle? The rabbits of course: they’ve destroyed or seriously diminished several plants in the bed. But I snatched successes. I protected some new additions with chicken wire: small Rugosa roses for example – though they aren’t visible in these shots. I might remove the wire next year if the roses are big and prickly enough to – satisfyingly – scratch a rabbit’s nose. 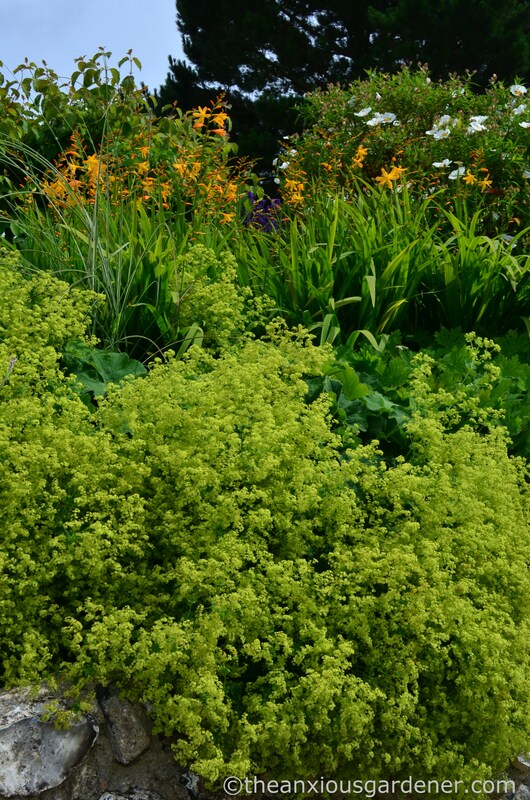 Thankfully, Hazel and chums aren’t very interested in sedum and I’m pleased with the amount of bud after my brutal Chelsea chop in early June. 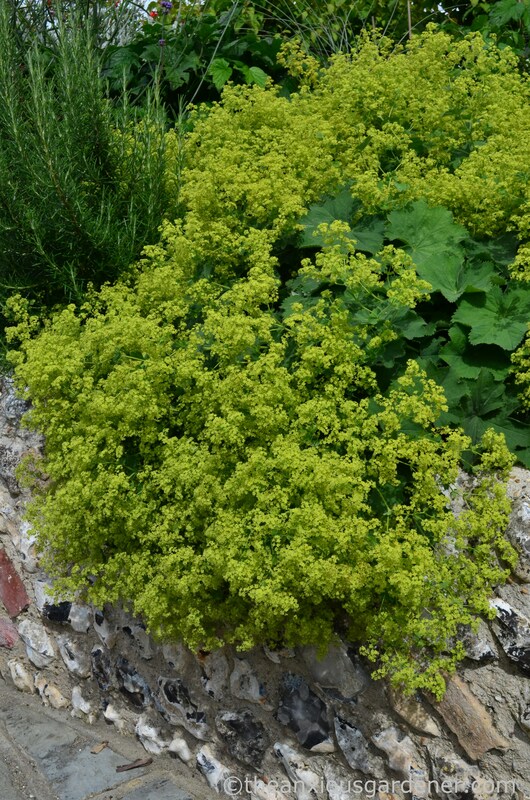 And the Alchemilla mollis here is the frothiest I ever did see. The rabbits leave this alone too – perhaps it doesn’t taste as good as it looks. 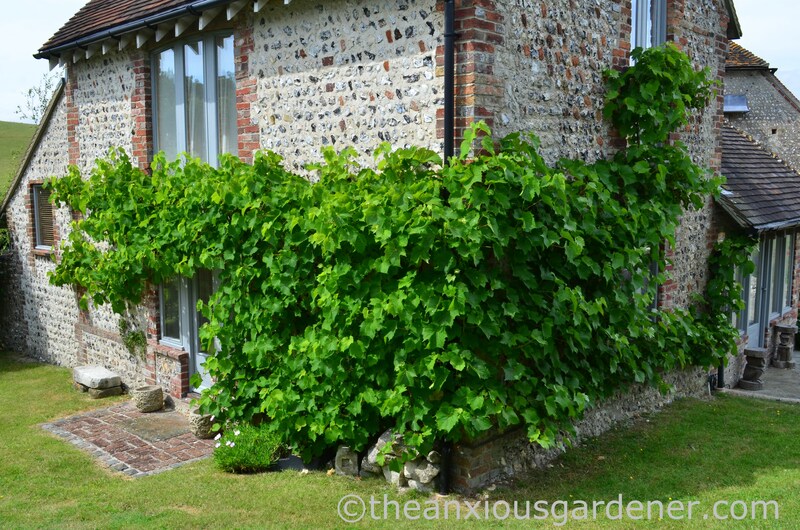 Onwards to the southern end of the house where, six years ago, sat a sad, four-foot high grapevine. I’ve showered this vine with a lot of love over the years and it has generously repaid me. and kept it to height that doesn’t make regular pruning too nerve-racking. (I have no head for heights). And it produces very sweet, if small, black grapes too. 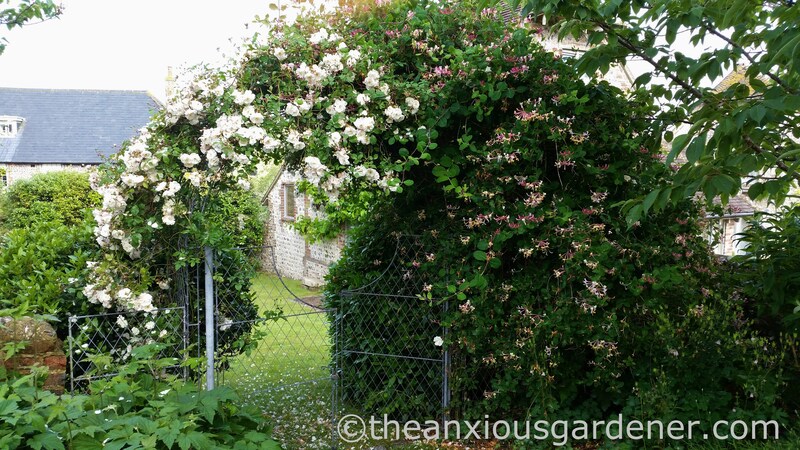 Turning away from the house, I’ll open a gate and politely nudge you under a rose and honeysuckle arch – this photo from June – into the ‘rabbit-proof-garden’. (I call it this as it is the only part of the grounds fully walled and fenced against the white-bottomed ones … but is it rabbit-proof? No, not really. Baby rabbits squeeze under the gate and adults sometimes hop effortlessly over walls – especially if I chase them). with Japanese anemones in flower. 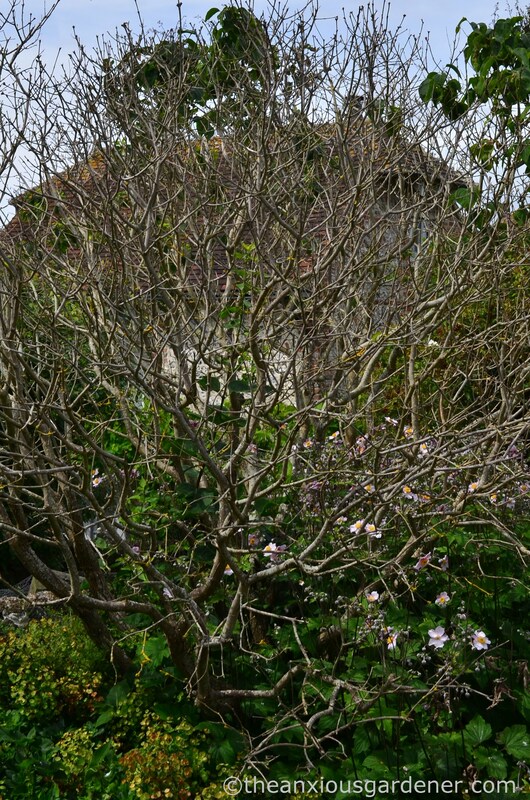 Behind those is a once beautiful white lilac … whose branches have now mysteriously died. Shame. I’ll cut away the dead wood this winter and hope that it recovers. There are plenty of new shoots. 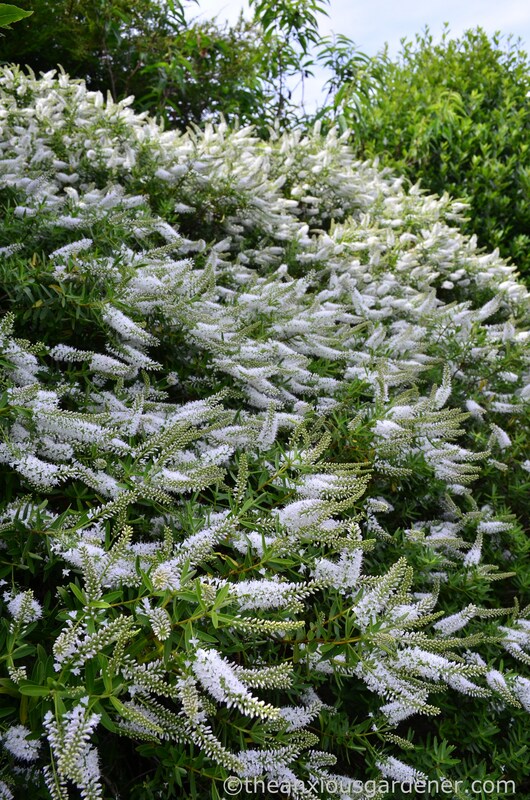 It has a delicious scent and is covered in white flower, butterflies and bees. I don’t know the variety. It’s about seven feet high and twelve wide. Anyone know what it is? H. salicifolia perhaps? 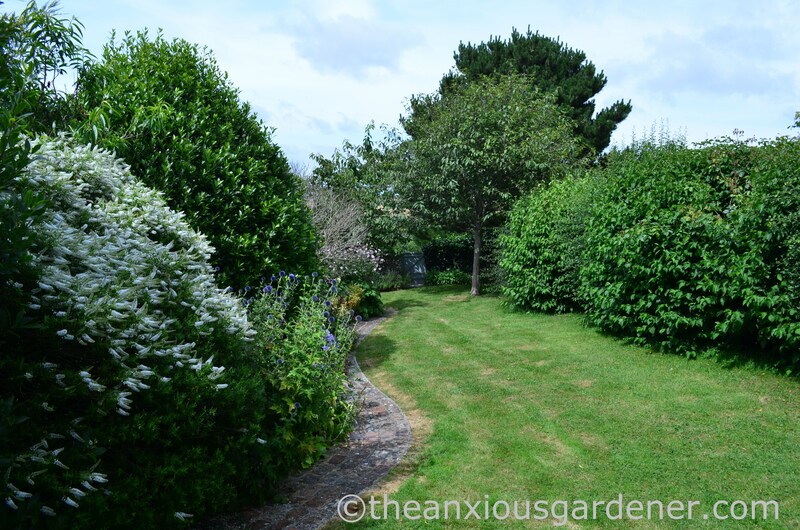 Still pondering, we finally arrive at the veg garden – only this year, I didn’t grow any. If my rhubarb is a triumph my onions, beans and potatoes struggled with once a week watering; especially in high, very free-draining, sun-baked beds. Short of running a pipe up here and installing a watering system, vegetable growing is hardly worthwhile. A plastic greenhouse sat here until recently but, battered and partly destroyed by winter storms, I dismantled it. I weed the gravel (but maybe this will be another gravel garden?) 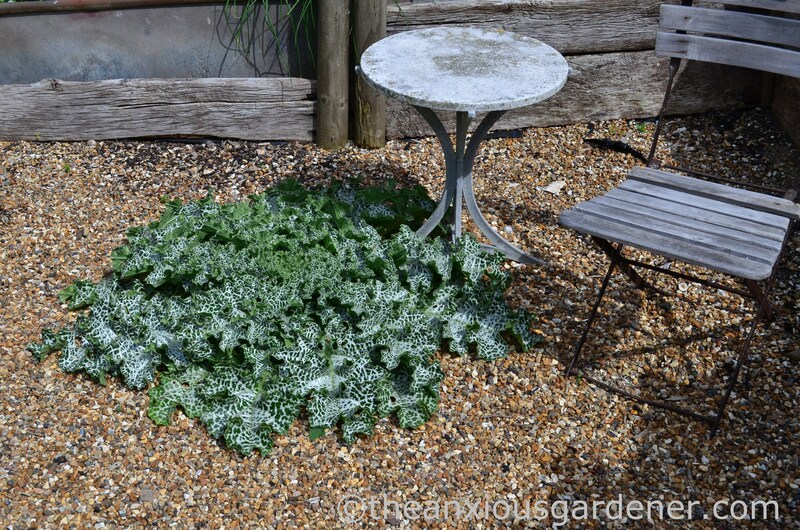 and the owner has brought up a chair and table for quiet time – in the company of a fast burgeoning, self-sown milk thistle. It’s bigger than a dustbin lid and I haven’t the heart to remove it. 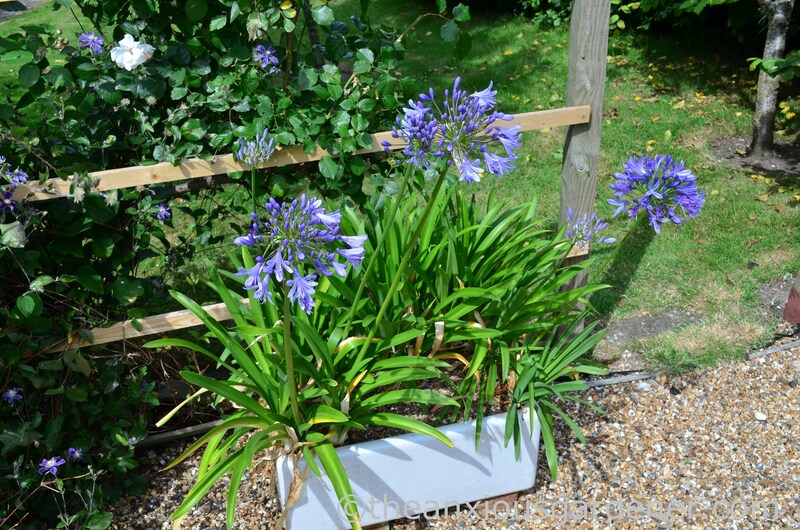 Nearby, is an old butler’s sink which lay empty for several years until I filled it with agapanthus. It’s flowering at last and would look smarter still, if the gardener pulled off those dead leaves. 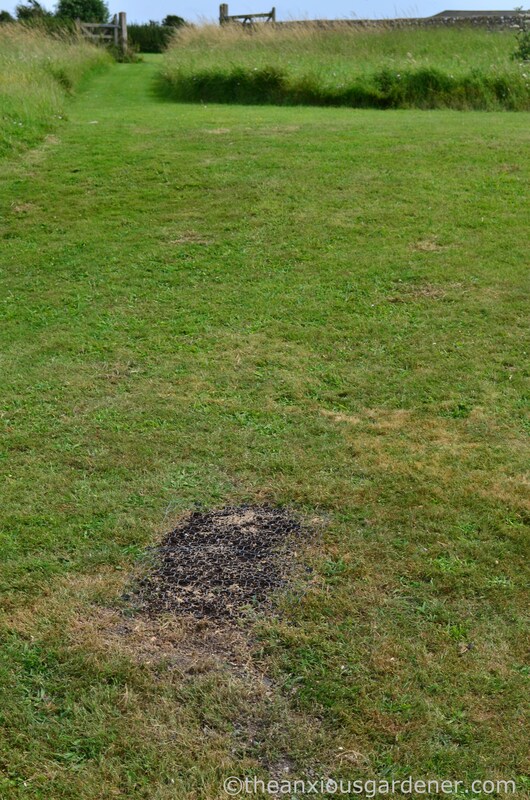 One of many rabbit holes on the lawn, re-seeded and netted against further digging. So … there you have it: a quick view of The Old Forge garden and grounds (if not the acres of rough grass with mown paths nor the wooded area to the north). I’m only here for 8 hours a week and most of that time I strim and I mow. But I think it looks pretty good for a five acre garden on short hours. 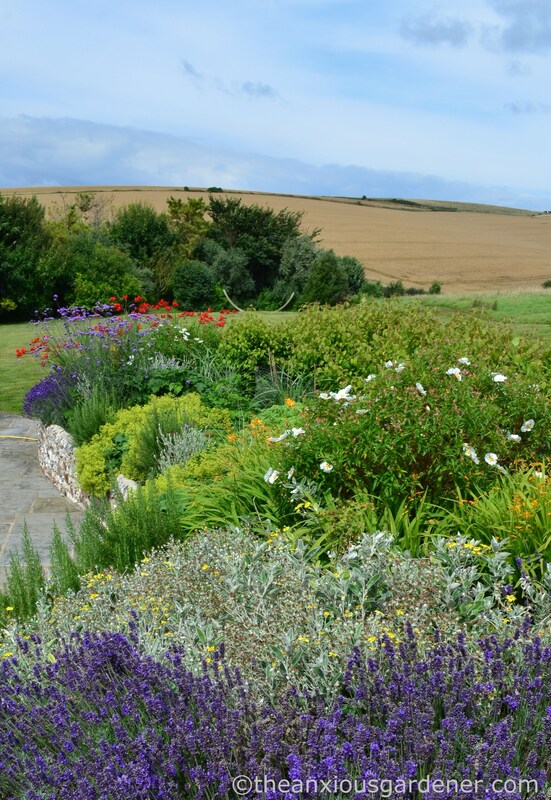 I like working here – in the heart of the South Downs – enormously (despite the devastation by rabbits … and a badger). I thought that after over five years it deserved a proper – if very, very belated – introduction. just looked through your blog. its raining so not much point in trying to garden. 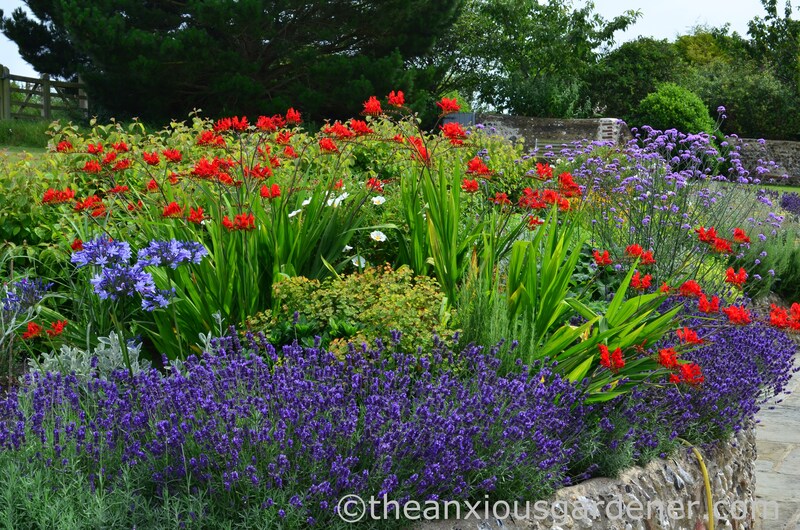 Some really great planting combinations. What is the lavenda in the new border the colour is so intense. What a wonderful tour! I can’t believe you manage to keep it looking that good on just 8 hours a week. I love the agapanthus in the sink. I’ve been thinking of growing them for some time and you’ve insipred me to find a wonderful container and go for it. And that milk thistle is divine. Random pop-up plants are such treats. Right, I’m sold. I adore them. Tea breaks very important component of gardening! What a lovely garden and location. 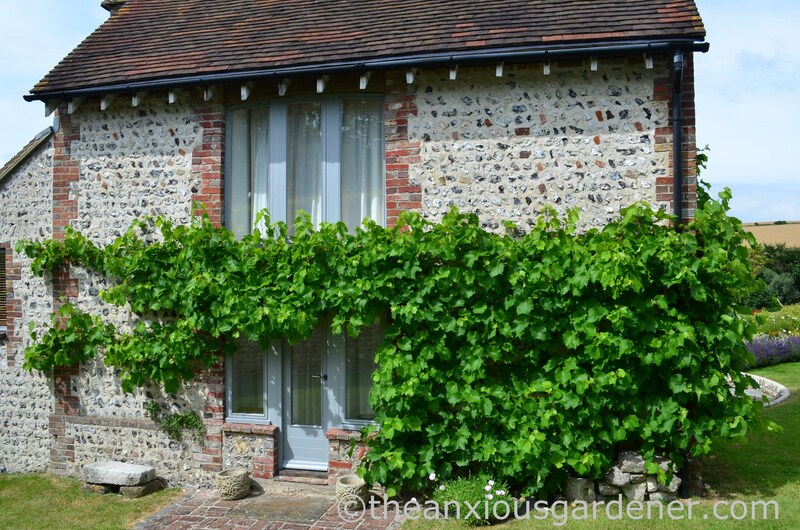 We stayed on the edge of the South Downs recently so we could visit Woolbeding and Parham and loved the area. I’m a sucker for brick and flint cottages as they remind me of a village we used to live in by the Thames. Hebes. They seem to be popping up everywhere at the moment. I never used to like them, scarred by some woody monstrosities growing in the garden of a rented house we used to live in. Maybe I need to revisit them. Thank you for this lovely garden tour. You are quite the “Mr McGregor”, with your ongoing rabbit-battles, but the garden is obviously burgeoning under your care. I wondered whether the grape might be a Black Hamburg. And there are two things I always think it’s impossible to have too much of: daffodils and lady’s-mantle! A very enjoyable tour Dave. But where is the blood. Get out there with the air rifle. Or better still, a machete. Show those bunnies that you mean business. The new border is magnificent, what a place to sit and drink in those views. 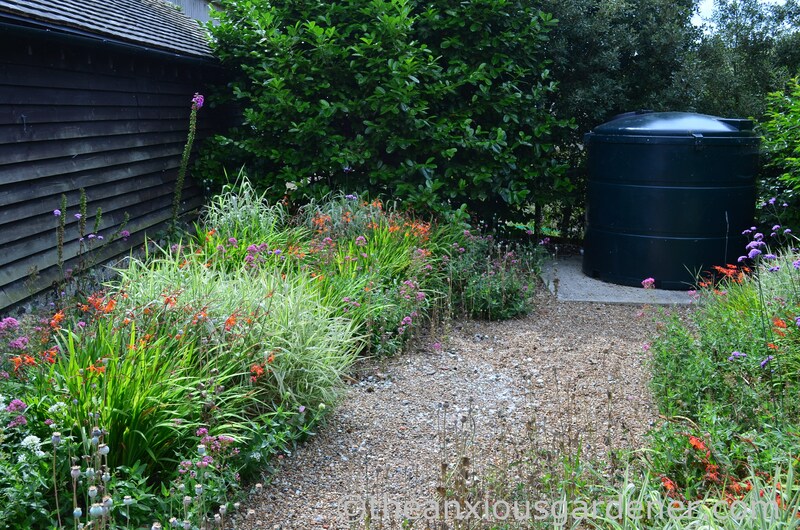 I’m envious of the gravel garden too. Foxgloves never seem to grow where I put them, they much prefer to find their own space.. like in the roof! Keep up the fight with the rabbits. We’ll never win but it’s as well to let them know how we feel. I’m impressed by the hebe. And it has satisfied my curiosity, having bought one myself earlier in the year with no idea as to what the flowers might look like. Anyway, as other commenters have said, you do an amazing job, particularly on eight hours a week. I love that Virginia creeper, and the orange and blue theme bed. I’m battling rabbits on a five acre garden I work at. I’m finding they go for the fresh new growth in spring, but aren’t so bothered if we can get them past that stage. They won’t touch lupins, lavender, astrantia, bergenia bressingham ruby, hebe sutherlandii, pinks, and sedum purple emperor. Good luck with your work, and thanks for sharing your photos. I can’t believe you look after all that in just 8 hours. 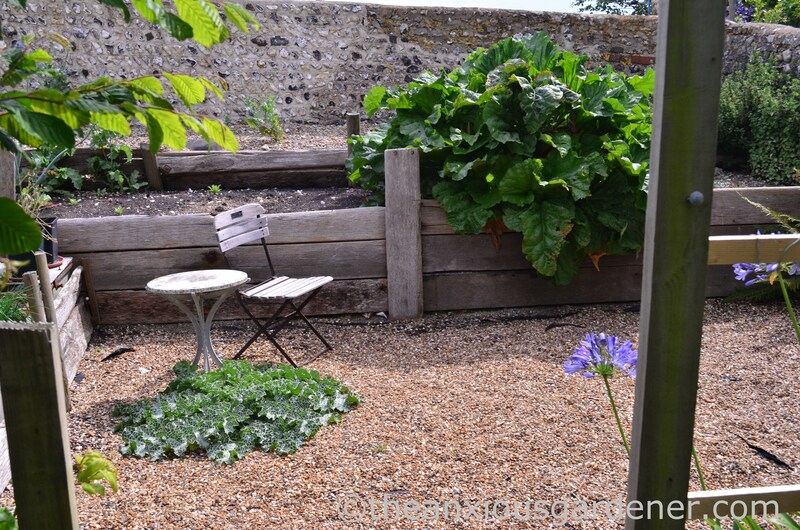 Your gravel garden was the inspiration for my new raised bed. 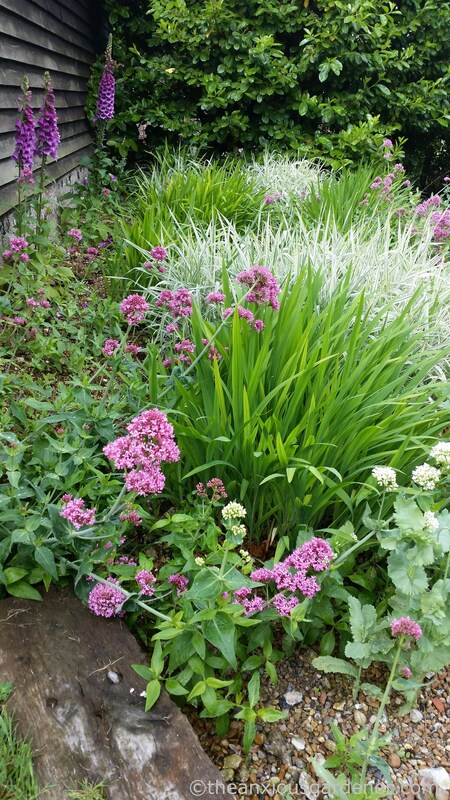 In the end it didn’t turn into a gravel garden, but I did do something with a border that I had never had any success with in the past. 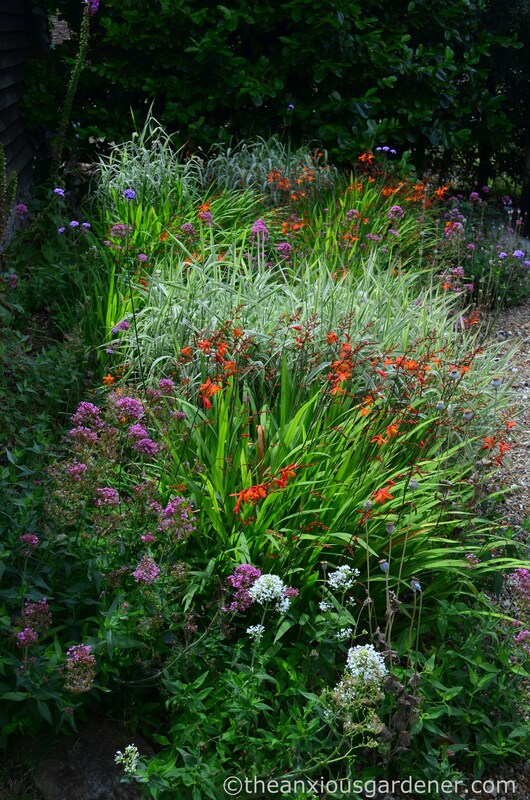 I am trying a mixture of grasses and wild flowers and hope to show it on the blog next year. 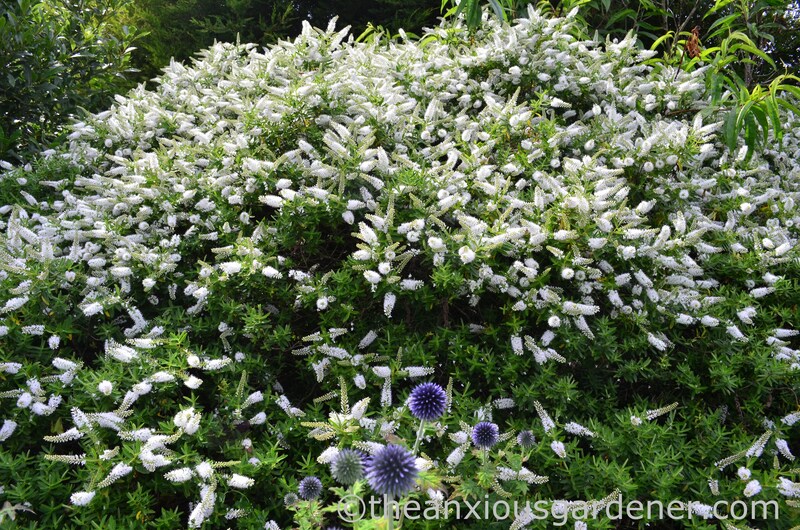 I was also interested to see the white hebe. Some neighbours of mine have one very similar and have just given me a cutting. I hope it is the same. That is a lovely garden, Dave, despite the rabbits. On the whole, I’d say you’re winning. WOW! This is beautiful, thanks for sharing your oh so lovely work space. Your garden has a simplicity, and a laid-back beauty. Your blog shows we have problems with our gardens all over the world. Drought and high Temps here this summer. Keep up the good work. Gorgeous. 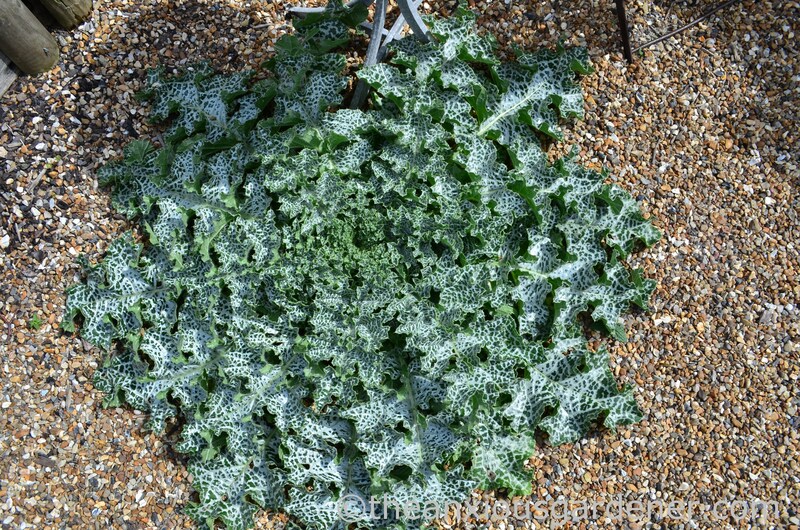 Genius on the Sedum Chelsea chop too. 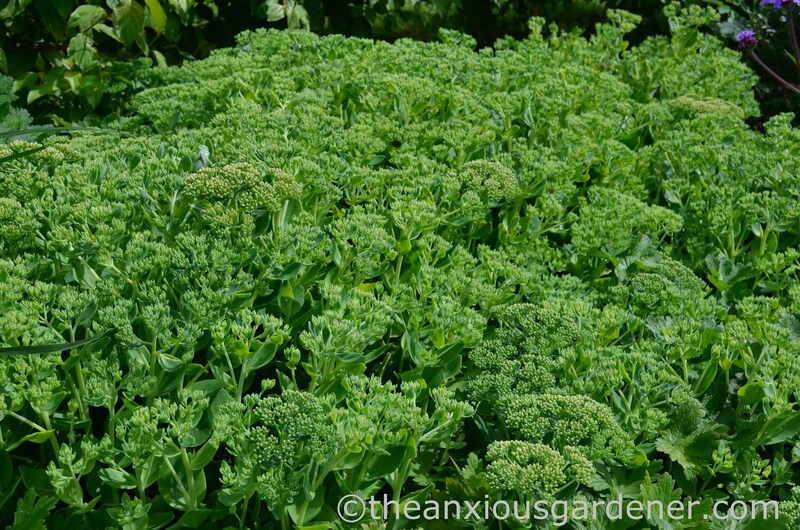 I’d never have thought to apply it to Sedum. Perhaps it’s standard here and I’ve been too long gone but a great plan for avoiding the gappy middle issue. 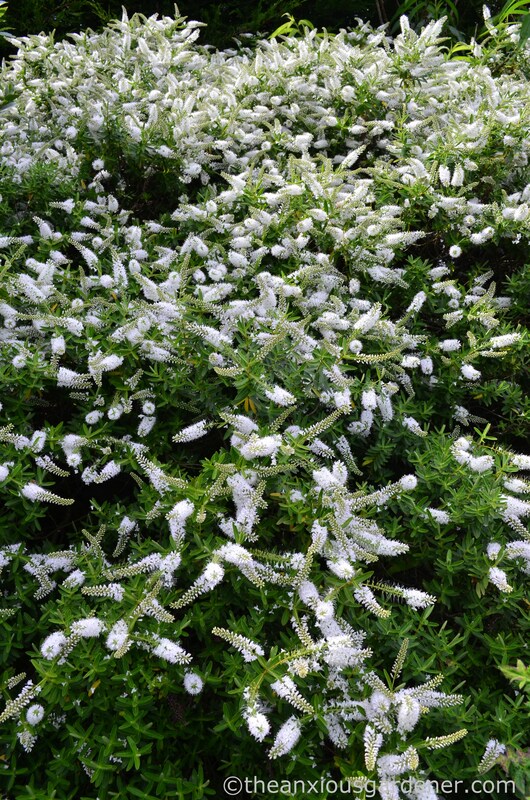 ‘Your’ Hebe looks exactly like my H. salicifolia I had in Canberra. That too was incredibly vigorous, despite my terrible soil and lack of water. Speaking of which, I thought you’d mastered irrigation pipe laying? So what’s with the empty vegetable patch? Anyway, great to see you blogging again. We miss you! It sounds like you have a huge project on your hands, so completely understandable that creating a nice place to live comes before writing. We’re still house hunting so I may feel the same before too long! Oh dear. I’d thought you would be settled in by now. Good luck with the hunt – I feel your pain. Beautiful! I love it!! Magical, King Arthur-ish!! I used to grow and sell organic cut flowers for florist shops and my biggest seller was alchemilla Mollis!! They use it as a bouquet filler and I thought of it as weed, it was so abundant, it was easy and profitable to bundle and sell. I love the creeper! Love that red! Very nice tour! Great tour, David. Your design is simply beautiful. Amazing what you have done in 8 hrs/wk. 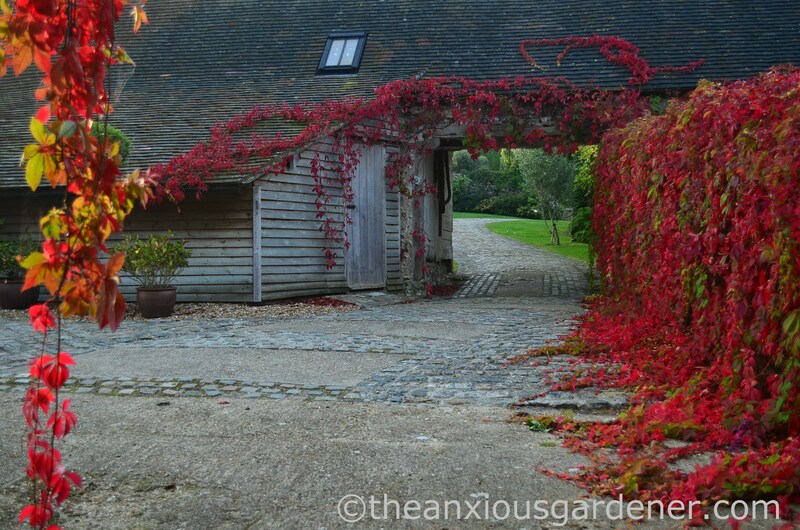 I love the Virginia Creeper – stunning fall color. It made me realize that in only 6 short weeks, ours will look like that (mixed feelings there). The hebe is gorgeous (too tender for my garden, alas) and the milk thistle looks like a snowflake, so beautiful! Lovely. If you can manage to achieve that with 8 hours a week, please let me know if ever you decide to move to South Wales. You’d be welcome to a day a week (and no rabbits, other than dead ones placed in a designated trophy area, in return for a handful of Dreamies treats, thanks to a very capable resident cat). 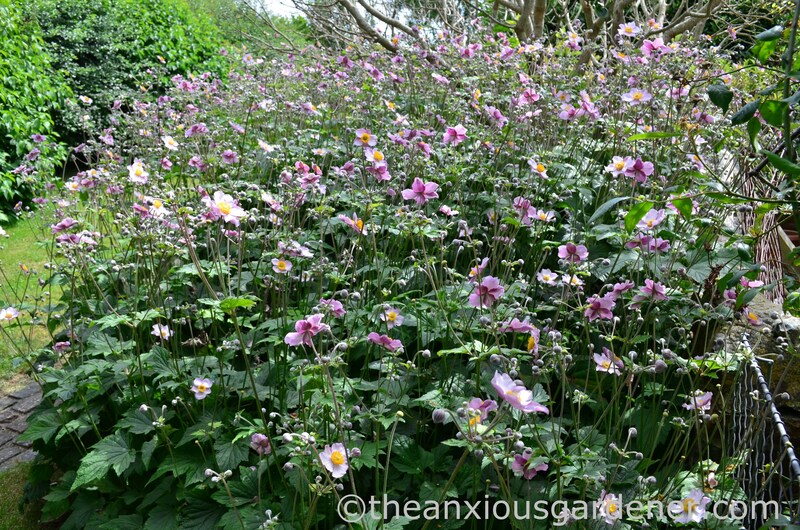 Just hope you’re never asked to remove those Japanese anemones – I’ve been trying to clear a bed of them since last summer. After 20 years they were looking tired but the attempt to dig them out completely has simply induced new vigour which, I suppose is a plus. I think they’ll stay! OTOH, I’ve given up with Virginia creeper. Mine just wouldn’t creep or turn red in autumn. Lovely! Thank you for the tour!